Several hundred activists have taken to the streets of a Paris suburb, protesting against new labor reforms which will make it easier for companies to hire and fire workers, and accusing President Emmanuel Macron of failing to represent the people. The rally, organized by a group of trade unions, Solidaires and the CGT as well as associations like Attac France and Members of the Right to Housing (DAL), denounced the reforms of the labor code that is currently under government discussion. 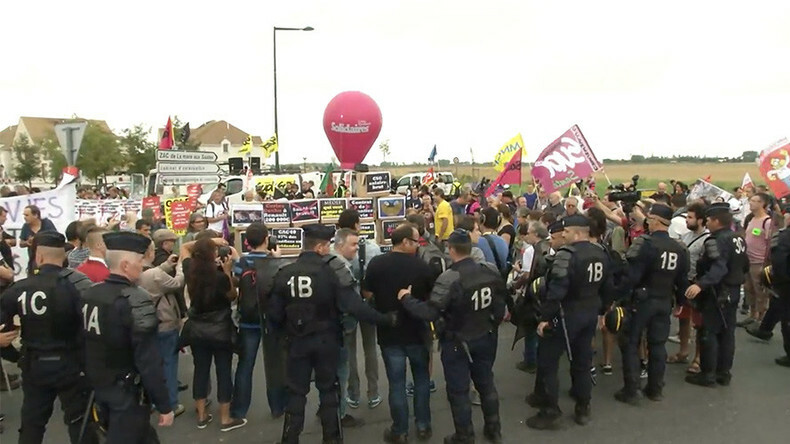 Protesters arrived at the HEC School of Management in the Jouy-en-Josas suburb –where France’s largest employer federation MEDEF are hosting their ‘Summer University' – to speak out against the perceived influence of the French business lobby over their newly elected business friendly president. “Mr. Macron represents the big bosses, and those who want to cut public services, social protection and everything achieved by workers,” one of the protesters at the rally told RT. The Movement of the Enterprises of France (MEDEF), has been making their own demands to Macron’s government as it works to reform the country’s Labor Code. Speaking to Europe 1 radio, the vice-president of MEDEF Thibault Lanxade confirmed that his organization has great “confidence” in the reforms carried out by Macron. Protesters however believe that MEDEF, which represents over 750,000 companies of all sizes, does not represent the interests of workers. “It is about ideology. To be able to sack workers more easily and stop work. In fact, he wants to get rid of employee protections altogether. It is a big attack of the hierarchy. Corporate deals will now take over,” another protester added. Reforming the country's strict labor laws has been one of Macron’s top priorities. On Tuesday, his government begun the final round of talks with trade unions’ representatives on liberalizing the labor laws which the government hopes will reduce the 9.5 percent unemployment rate in France. Francois Hollande’s Socialist government sparked months of protests trying to push through a less ambitious labor bill last year. Now Macron strives to grant employers more power to negotiate employment conditions with workers, which some believe will diminish the weight of trade unions. The 39-year-old former investment banker also wants to cap the compensation awarded by courts in workers dismissal cases. The final version of the reforms will be presented on 31 August. The CGT union has already called for a massive nationwide rally on September 12. Force Ouvriere (FO), the third largest trade union in France, turned down an invitation to participate. Despite the snub, huge numbers are expected to march through the streets.